Australia is the home of the macadamia nut. Australia accounts for about one-third of world production. Husk spot caused by Pseudocercospora macadamiae is a serious disease affecting macadamia in Australia. Husk spot has not been reported from any other macadamia producing nation. The spores adhere to the husk, germinate and penetrate the host through openings (stomata). A major part of the economic impact is caused by premature fruit abscission from the tree when the kernels are still immature and of low oil content, making them unsuitable for processing and consumption. Author: Akinsanmi. O. A., et al. Affiliation: Tree Pathology Centre, The University of Queensland. Title: An integrated approach to husk spot management in macadamia. Source: Plant Health Management: An Integrated Approach. APPS 2009. Pg. 22. 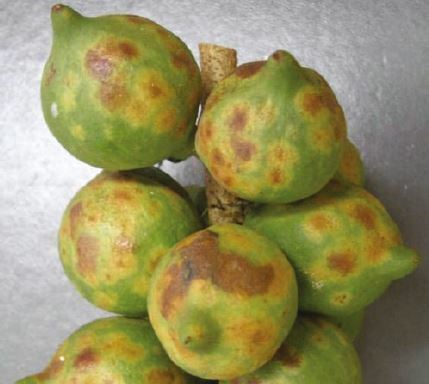 This entry was posted in Fungicides and tagged Australia, Fungal Disease, Husk Spot, Macadamia Nuts, Premature Fruit Abscission by pesticide guy. Bookmark the permalink.